Under the Sky: Why are you waiting? Bring on whatever you want. Why are you waiting? Bring on whatever you want. It is impossible to study Roman history and not also study the early Christians and their astonishing trials. In his work, Apologeticus, the 2nd-century Church Father Tertullian wrote that "the blood of martyrs is the seed of the Church." This was absolutely true then and is still true in parts of the world today. The stories of our forefathers and mothers in the church are encouraging yet haunting depictions of incredible faith in a living Savior. I read their stories and I am at once amazed and chastised. She would die in the arena in 203 AD. The record of her faith comes to us today and it is not for the faint of heart. Would you face the arena with the same grace and joy that she did? I am not sure that I would. Then there is the powerful story of Polycarp. His martyrdom story can be read in full at the link, but this portion was particularly powerful to me. 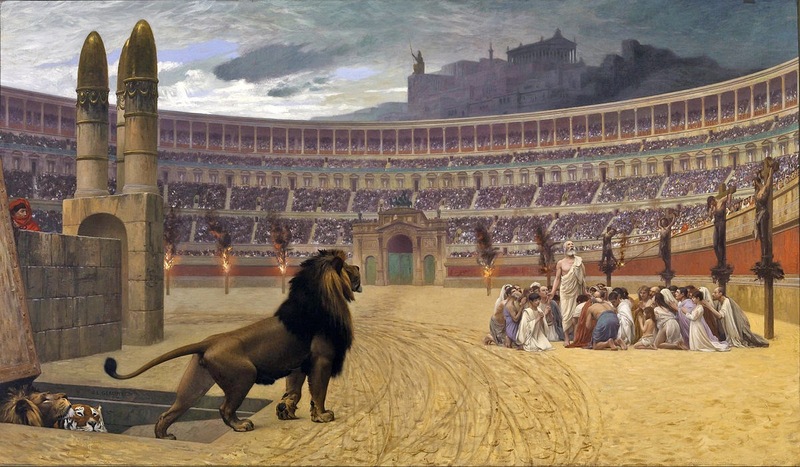 We have been reading Trial and Triumph this year- stories of Christian martyrs- as we've talked about the Romans. Their stories are very moving. And they've made for some very good discussions with the kids. Nothing sweeter than free to a homeschool mama!